First of all, let's get one thing straight about this game. This blog post is about the Japanese version released for the Famicom by Kyugo. It's a horizontal shooter that loosely resembles the arcade game of the same name. The Airwolf released for the NES in US and Europe by Acclaim is a completely different title that uses an inside-the-cockpit view for a totally boring experience that has nothing of the excitement the TV series was famous for. This doesn't mean that the Japanese game is the epitome of badass helicopter action though. For all its flaws and overall ineptitude, one could say it's almost as inane as its Western counterpart. Airwolf is the codename of a high-tech helicopter equipped with heavy armament and stealth capabilities. It takes off from its hidden lair to fulfill secret missions around the world. According to the Famicom game, the ultimate mission is to rescue the pilot's brother, missing in action years ago and held hostage by an evil organization. To accomplish that you'll need to get through six stages of increasing perils armed with a combination of two types of weapons selected at the start of every mission. While this sounds great on paper, the execution unfortunately fails to live up to the legacy of such a great TV show. Slowdown, unstable frame rates, flicker, bad visibility, lack of autofire + capped firing rate, unresponsive controls, inertia... in essence, everything you need for another dose of inglorious 8-bit torture. As mentioned above, prior to starting the level you need to equip the chopper. Button B cycles the primary weapon: chain guns (a 2-way shot that resembles "double" from Gradius), cannon (a very slow straight bullet) and falcon (like cannon, but faster). Button A cycles the secondary weapon: hellfire (a 45° downward shot), red eye (90° falling bombs) and copperhead (missiles fired downward at a 30° angle). Any weapon combination is possible, just note that some of them have similar design: chain guns + hellfire results in a 3-way spread shot, whereas falcon + copperhead combine the same bullet types for much stronger firepower. The only use for the cannon is being devastating at point-blank distance (tip for the final stage!). As for the red eye, it's pretty much useless. 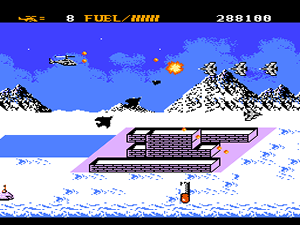 Once the game begins, the player shoots with button B. Button A is of special nature since it toggles the supersonic capability of the Airwolf. When active, the helicopter flies at "supersonic" speed while being invulnerable and consuming the fuel gauge shown at the top of the screen. You don't need to worry about depleting fuel, if that happens you'll just be unable to engage in supersonic flight. The bad news is that unless you're qualified as a grade A button masher you'll need a decent turbo controller. The firing rate is severely capped and the only way to increase it is by taking the POW items left behind by selected destroyed enemies. The game only becomes acceptable after you take at least a couple of those. Other items to be found consist of smart bombs (stars), extra lives (1UP) and a bonus token of 3.000 points. They are almost always released by destroying single jets that zap from behind trying to ram into you. Approximately halfway into some levels you'll also come across a stronger opponent that flies back and forth and takes a lot more hits to be destroyed. These minibosses are often escorted by lots of other enemies, so don't hesitate to use the supersonic speed if things get too hectic. One example of this is in stage 2, where bullets fired by antennas on the top of the buildings also tend to block your firepower. Speaking of bosses, the main ones (except for the final boss) must be fought as if you were playing a gallery shooter. The problem is that these parts are plagued with a combination of reduced framerate, apalling slowdown, unresponsive controls, crosshair inertia (!) and just sheer confusion. You can't really tell the reason why your energy gauge goes down, for example. For all it's worth it's at least a harmless chore, for never once did I die in one of these bosses no matter how sloppy I played. Despite all its shortcomings, Airwolf packs a surprisingly decent enemy gallery. It's not all about jets and choppers. Tanks, turrets, submarines, fast-moving missiles, slow bombers dropping rockets, falling missiles that go out in a huge flash, evil faces carved in the mountains. Stage themes range from the lakes and mountains of the countryside, city, caverns, ice and a desertic entry into the enemy headquarters prior to two timed sections where you fight the aforementioned carved sculptures and the final enemy helicopter. It's just too bad the game's execution is so poor. That said, the music is the only aspect that fares a little better. Though technically subpar, it includes the famous opening theme and in general tries to capture the essence of the show. Since the 1UP will always be there even if you die and get sent back to a checkpoint, there's at least one instance in each level where you can exploit this to boost your score. Yes, the scoring system might be broken, but given the firing rate issues it's not uncommon to see that 1UP go away in between your shots. Note that there are also score-based extends, but these are awarded with successive double figures starting with 50.000 points (next ones at 100K, 200K, 400K, etc.). An interesting twist in this version of Airwolf is the rescue command passcode gimmick. A combination of 5 numbers is shown at the end of levels 1 through 5. If you want to see the ending after you beat the final boss you must enter all five passcodes correctly or the game will end abruptly with that dreadful view of the Statue of Liberty fallen to the ground. A pen and a sheet of paper should suffice, there's plenty of time to write down the passcodes and to type them in the end. Time, however, is what you absolutely don't have to take note of your final score since it's shown very briefly once you defeat the last boss. After that you'll input the passcodes, see the ending, see the credits and then get stuck in a THE END panel. Well then, if you just want to see your completion/1CC high score you might as well refuse to insert the passcodes and check it out at the start screen after the GAME OVER. Would failing to see the ending still count as a legit clear, I wonder? 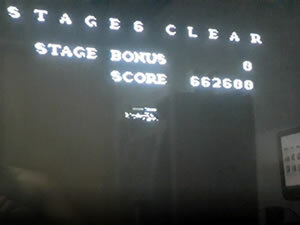 Anyway, I did it the hard way and filmed the game's final moments, so here's the 1CC score I got for Famicom Airwolf. I used chain guns + copperhead all the way, with the exception of chain guns + hellfire in stage 3 and cannon + copperhead in the final level.